Well, we survived The Blizzard of '09. Guests, especially those who visit in high summer and contemplate a quiet retreat here come winter, often ask how much snow we get. From a gardening standpoint, we're Zone 7a, which means we our low temperature could be 0 degrees. Yet Southampton, with a coast on both sides (Atlantic on the south, Long Island Sound to the north), generally enjoys a relatively snow-free winter. Usually winter brings us a couple of storms that dump a 5" powder-sugar pancake that melts within days. The more trecherous possibility is that, halfway through the snowmelt, the weather turns suddenly colder and freezes the remaining slush into ice, which can remain for weeks of clear, cold weather. But a white Christmas? It's happened exactly once in the 17 years that Chris and I have been in the Hamptons. So a snowstorm was forecast for last Saturday, pushing up the coast and tracking northeast. The news stations, always quick to try to make a weather event into Big News, started hyping it a few days in advance. Eastern Long Island could receive as much as a foot of snow, they warned, and with the winds forecast, it could become a blizzard with white out conditions. Oh boy. We had four rooms of guests scheduled for arrival. One of the four cancelled; they were coming from Boston, and the possibility of being snowed in was a risk they couldn't take. But everybody else arrived, and at that time they did we had a festive little dusting of snow (see the December picture to the left). But soon snow was falling steadily, and Santa's planned visit to the Southampton Chamber of Commerce wasn't getting a lot of traffic. As the snow continued to worsen, shops and even restaurants began to close. Still, the fire was cozy and crackling in our living room, and we made sure our guests had dinner reservations close by. Sunday morning we woke up to two feet of snow, not counting the drifts -- a record for the area. (Take a look at this picture here, then scroll down the page and contrast it with the shot of the same area, labeled July 2009.) At seven AM, while snow continued to fall, we began to clear what we could. I shoveled the front stairs while Chris fired up his snowblower (the first time in three years he'd been able to use it) and cut a path to the back gate and out into the car park. Our neighbor Perry Delalio, who owns the stone and asphalt company down the street, was kind enough to bring his bulldozer round to plow the driveway enough to be able to drive the cars out. But we had the guests' three cars, not to mention our two, to dig out, which had to be done by hand. And news stations were reporting that Southampton was considered a snow emergency -- even the plows were getting stuck. We might all be snowbound here. I went back inside to prepare breakfast, and as I did, down the stairs came Jim and Norman, two of our guests, pulling on gloves and hats and carrying snow shovels. Bless their hearts, they were not only prepared to help, they had brought snow shovels WITH them! (Jim even had snow chains in his truck!) And for the next hour or so until breakfast, and for an hour or so afterwards Chris and the guys and even some of the gals all worked to free the cars. It was such a great example of the spirit of the holidays. Our third set of guests were a lovely young couple originally from Arizona, for whom this was not only their first winter on the East Coast, but their first snowstorm. They were scheduled to fly back the following day to Phoenix for the holidays, where I'm sure our blizzard will be a great story! The weather has remained at freezing point the past two days, so little snow has melted, though at least now the roads have all been plowed to a greater or lesser extent. The weather report threatens more precip for Christmas Day, though chances are it will be rain, making ice sculpture out of our snow piles. 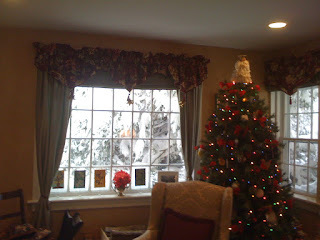 But I doubt it will wash much of the snow away, so we'll have a white Christmas after all. So as for us, we're going to enjoy the view from the window with a cup of hot chocolate and Christmas music playing in the background. Wishing everyone all the blessings of the season, the love of family near and far, and a happy, healthy, and safe New Year!! As for me, cookies are baked, shopping is progressing, cards are in the works. I found a cool new site called Pandora.com that designs a music "station" around your personal preferences, and so I've created a station called Instrumental Holiday which plays in the background of my computer all day while I work. So many people think that this time of year is "dead" in the Hamptons. They couldn't be more wrong. True, the traffic looks nothing like a summer weekend -- you can get to East Hampton in twenty minutes, instead of more than double that in August. But each village is decorated for the holidays, with lit Christmas trees flanking the sidewalks of the center of town. And lots to do. Found some great stuff at last weekend's Parrish Presents bazaar. This is one must-do event for anyone visiting over Thanksgiving weekend: an annual shopping event comprised of wonderful boutique items, a silent auction for incredible things like Chanel handbags and golf and spa weekends at La Costa, and -- our favorite -- a huge "tag sale" of gently used furniture and housewares, donated by the community (often by the very wealthy membership that supports the Parrish Art Museum). There is a benefit cocktail party on Friday night, then the event is open to the public on Saturday and Sunday for a modest $5 entrance fee. We scored tickets to the cocktail party, where we saw more of the Meadow Club membership (affluent residents of the Estate District) than we ever see all summer long. Here in Southampton, a whole series of holiday-inspired events called Southampton: It's A Wonderful Village are planned. This Saturday, for example, there are guided tours of the Historical Society's Rogers Mansion, all decked out for the season...horse and buggy rides through the village...a parade of fire trucks, each decorated with lights, at dusk...a tree lighting of the enormous evergreen in Agawam Park (which they DO use a cherry picker to decorate! )...outdoor movies shown on the corner of Main and Job's Lanes...lots of music, cookies, cider, and goodwill to men throughout. As soon as our guests are settled and concierged, I'll be in the center of the village, enjoying the holiday spirit! Warning: This may be a little mushy. Most of us reflect on what's wonderful in our life on Thanksgiving Day, but I like the idea of stretching it into a whole season. And, with the weather sliding into full fall (as I write, we’re at the tail end of peak foliage season) and things quieting down, I feel like I actually have some time to reflect and appreciate all that I have. I am so grateful to love what I do for a living. One of the quotes set out on our breakfast table, by H. Jackson Browne, the author of “Life’s Little Instruction Book,” says Find something you love to do and add five days to your work week. I am grateful that we can make a living “having company” -- something that was a rare treat for me, growing up in California, half a continent away from most of our relatives. I feel blessed by our wonderful guests, many of whom come back time and again and have become friends. I am grateful to live in this beautiful area. I appreciate the beautiful beaches and the climate that makes it such a draw in summer…and I appreciate the quietude and peace of the offseason, when I can spend time creating, whether it be food in the kitchen or characters in a book. Most importantly, I'm really, really blessed to have Chris in my life, and that we make such a good team, at home and at work. Another nice thing about the quieter season is being able to go out to dinner more. Those five-star, $$$$ restaurants that you can't get a reservation at in season? Now you can not only get a table, you can get a prix fixe three-course menu. 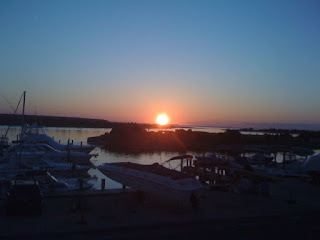 We had a wonderful dinner last week at Della Femina, and at Stone Creek Inn the week before. Tonight, I'm taking a cooking class at Muse Restaurant on alternatives to the traditional Thanksgiving side dishes. Chef Matt is such fun and so talented, I look forward to a great time and some wonderful ideas! 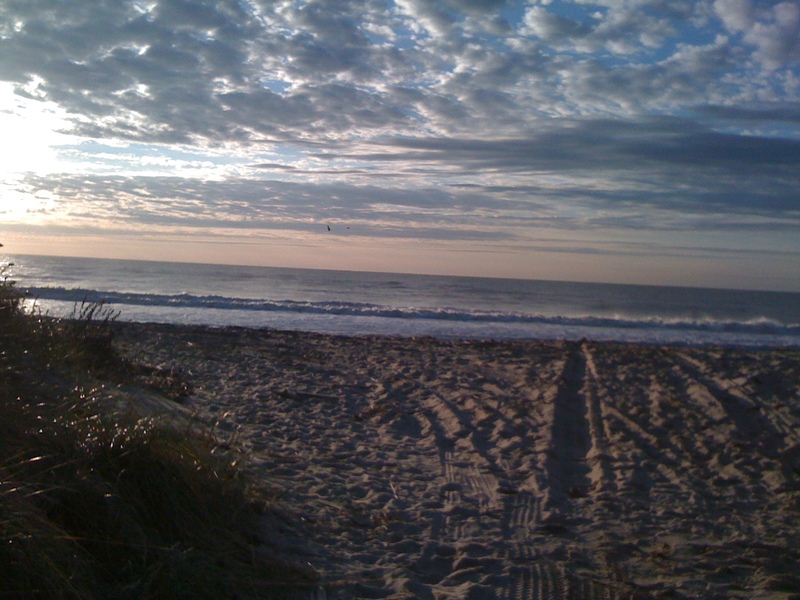 The past few days have been incredibly beautiful -- I took the picture above on my walk early this morning at Gin Lane Beach. 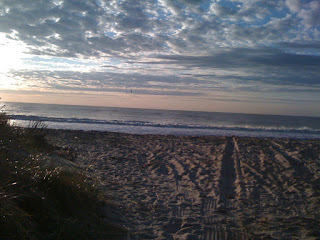 The early morning sky and the light on the waves was incredible. Not a soul on the sand for probably a mile in either direction. Life is good...and I'm especially grateful for that. There was an article last week in the New York Times about how “going green” is going more mainstream…in small towns like Nantucket, some schools and corporate communities, the concept of "zero waste" is taking hold in a big way. I'm glad to see people are more and more moving towards reducing waste, reusing and recycling. Here in the Hamptons, I see more and more grocery store shoppers using the reusable grocery bags. But I’m proud to say that other measures have been in place here for years. When Chris and I first moved to the East End, East Hampton was just putting the finishing touches on its recycling center (formerly known as the dump), and we really got into the “source separating” necessary before you could get rid of your trash. Beyond the usual bins for plastic, aluminum cans, newspaper, and cardboard, there were separate bays for glass (one each for green, brown, and clear), batteries -- whether tiny AAAA or automobile, mixed paper (for all that junk mail! ), and the immensely popular household exchange section euphemistically called “Caldor East,” after one of Kmart’s defunct competitors. Additionally, the leaves you collected for curbside pick up each Fall was returned to the center where, using green and some food waste, they produced wonderful mulch which you could come back with your garbage can and pick up in the Spring for free. Going to the dump and splitting up our stuff into all these stations was amazingly gratifying. We'd leave feeling like we’d done something, saved a little teeny bit of the Earth from landfill overflow. Recycling is in both Chris’s and my blood...whether it is repairing and refinishing furniture found in a thrift store or yard sale, or repurposing an item whose purpose is obsolete into something useful or decorative. Don’t even get me started on all the offcuts and discarded building materials Chris has fished out of the dumpsters on construction sites. And oh boy, do we compost. All those orange peels from the OJ, the hulls of strawberries and skins of pineapples, the thousands of egg shells, all the coffee grounds...Chris’s team of compost engineers, the earthworms, love all the green waste we deposit on the compost bin daily. 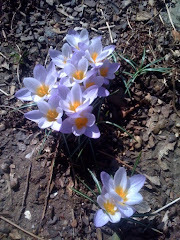 And his garden thrives with the resulting nutrient-rich soil. The photo above shows some of that rich soil on the ground in front of the bin where it is made, and the vegetables that benefit from it. After much consideration, the one amenity we decided we had to provide in small bottles is mouthwath, replacing our (repurposed!) crystal liquor carafes of Scope in view of possible hygiene concerns. It remains a difficult choice. We believe the days of individually-wrapped hotel amenities are numbered. Our world just can’t afford the waste. One bright light: Not long ago, Sean Doane of CBS Evening News did a story on how two former traveling salesmen founded a business called Clean The World to recycle those tiny bars of soap and send them to Haiti where, despite the known link between hygiene and the spread of disease, soap is a luxury few can afford. (We’ve all been reminded lately how important it is to wash your hands in order to halt the spread of the H1N1 and other flu viruses.) How cool is that? Meanwhile, here in our tiny corner of the world in Southampton, we’ll try to do our part too. We've had a very international month, actually. This past week we enjoyed meeting our very first visitors from Thailand, followed by a lovely mother and daughter from Australia. Later this month. we'll host a series of guests from England. There is much to do this holiday weekend: there is a Harvest Festival in Southampton, with a sidewalk sale, hayrides, a soup contest between a number of the village restaurants, delis, and caterers. Those who love the movies will enjoy the Hampton International Film Festival, which this year has venues here in Southampton as well as East Hampton. A very popular option and show stopper (literally, a traffic jam) is Pumpkintown, a seasonal park of slides, cool things to climb on, corn maze and good old pumpkin picking, located right on the highway near Watermill. Shops, highways, and farmstands were all very busy on this perfect Autumn day. Temps were in the mid 60's, with clear skies and a slight breeze. Just the weather our dog Truffle most loved. Truff's been gone just about a year now, and we are still missing her. So I headed over to ARF (Animal Rescue Fund of the Hamptons, where we adopted her 14 years ago now) to get a puppy-love fix by walking some of the adoptable dogs through their lovely woodland trails, kicking through the fallen oak leaves of autumns gone by. We're not ready to replace Truff yet, but when we do, there is no more laudable shelter than ARF...truly, a home away from home. The shelter holds an ARFan reunion each year, and when we'd bring Truffle back, she'd bound out of the car, run straight for the front door, wagging and grinning, eager to greet the volunteers...no unhappy associations for her! Pour over the bread and press the bread into the egg mixture. Cover both with plastic wrap and refrigerate overnight. Drop rounded spoonfuls of the topping roughly 1-1/2" apart evenly over the casserole. Return to oven and bake an additional 15 minutes, until golden brown and bubbly. Cut and serve. Pass with (optional!) maple or blueberry-maple syrup. "The Oldest English Settlement in New York State"
The sign that greets visitors to the village of Southampton, located at the top of our road, states proudly that Southampton was established in 1640 and is the oldest English settlement in New York State. (Chris, of course, takes some proprietary satisfaction in this.) For me, I never pass that sign without a little jolt of amazement. I make jokes to guests that back in California, if a structure is 50 years old, we knock it down (or an earthquake does the job for us) and build new. So when I first came out to the East End in 1992, I couldn't get over the sheer volume of history made visible that existed here. One example: Built in 1648, Halsey House on South Main Street is the oldest house in Southampton, and in season, you can tour it. Careful preservation and conservation by the Southampton Historical Society has meant that when shingles, roof, or windows on the house have to be replaced, they are made and installed to period specifications. To a much lesser degree, A Butler's Manor -- built in the relatively recent year of 1860 -- is designated a historic structure, which prevents us from altering the exterior of the house in any substantial way. (Fortunately we are free to update interior fixtures such as plumbing and electric!) When we had the house repainted a couple of years back, we had to clear it with the architectural review board. Though the East End has lost some of its farmland...wealthy Wall Streeters have built some sprawling Mc Mansions where once potatoes grew... I am still pleased to note that others make every effort to preserve and rebuild some of our more historic structures. A case in point is the rebuilding of the old Presbyterian Manse on South Main Street. In Spring, they began demolition down to the studs inside, which apparently precipitates the difficult and costly process of lifting the house. Using massive steel beams and pillars made of stacked railroad ties, they raised the house up about six feet above grade in order to excavate a full basement beneath and pour all new foundations. Seeing a house that is probably 6,000 square feet lifted in one piece, and balanced there for a few weeks while brave souls work beneath it, is an amazing sight! 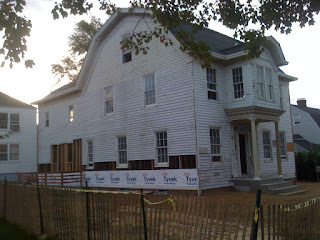 The picture here shows the house, recently set back down and attached to its new foundation. Now they can reframe the interior walls, insulate and reshingle. And when the project is complete, the neighborhood will look...exactly as it always has. I love that. That continuity, that preserving a sense of place, is a special thing about the community that I have come to value. Maybe it was because Labor Day was so late this year, but somehow, summer slipped away and whoa, here we are already in mid-September. When I first came to the East Coast and the seasons were still so new to me, I noticed that it was literally as though Mother Nature flipped a switch on Labor Day and put that note of Fall in the air. Certain trees, such as the horse chestnuts, have begun to drop a few leaves and nuts (to the delight of the considerable squirrel population in these parts). While the water at the beach, and especially our pool, is still swimmable, and daytime temps are mostly still in the 70's, the evenings cool down to the point of needing a sweater. Truthfully, September is my favorite month. The warm days and cooler evening temps give the garden a chance to post at least one last hurrah of color before autumn really sets in. It's a big travel month for overseas guests who are often making their first trip to the Hamptons, and because we feel a little less frantic too, we can spend more time helping them maximize their visit. It's also a favorite time for brides, as September is a big month for weddings out here. This weekend, we had guests here from two different wedding celebrations. With everyone in the house at a wedding last night, Chris and I had a chance to wander out to Bostwick's in East Hampton for a drink. The overcast weather hadn't affected business much -- both the bar and restaurant were doing thier usual roaring trade. Bostwick's has always been a favorite of ours for a relaxed dinner and drinks with a bonus of a sunset view; we've been fans of any restaurant that owners Kevin Boles and Chris Eggert have opened since the inception of their first, Santa Fe Junction, back in 1993. Alas, this will be Bostwick's last season at Harbor Marina, as the owners of the marina have renovations in mind. We'll miss those sunset views, but know that Kevin and Chris's welcoming ambiance and the friendly service of their loyal waitstaff will be present at their other two restaurants, Indian Wells Tavern in Amagansett and Cherrystones in East Hampton. I just wish they had a restaurant in Southampton!! The last week of August is the annual Hampton Classic Horse Show, a stellar week-long equestrian event held in Bridgehampton. It is one of the great entertainment values out here -- every day except the final Sunday (Grand Prix), attendance for a whole carload costs only $20. (By contrast, parking at Cooper's Beach costs twice that. Which is why we offer shuttle service to the beach! 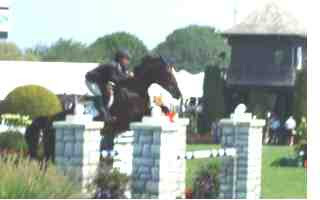 --but I digress...) I haven't been able to attend the Classic for probably ten years now, but this year I was determined to go at least once, to see my favorite equestrian. Zach, his mom, and often his father and grandmother have been guests at A Butler's Manor every Classic week since we opened in 2002, and I look forward to their visit every year. When we first met, Zach was a few days shy of 12 years old, a serious little guy with a shy smile and a big appreciation for my breakfasts. (I always plan a menu that includes Southwest Souffle, Banana French Toast and blueberry muffins during his visit.) He'll turn 18 next week, and every year, I've wanted to go see him compete. Yesterday I finally got a chance to do so. The Classic has grown in scope since the last time I attended. Yesterday, I counted 2 (3?) show rings besides the Grand Prix ring, plus a couple of training rings and practice areas. It is a joy just to watch the riders warming up their mounts. The show rings are gorgeous...reminiscent of a beautifully-landscaped backyard that just happens to have fences to jump. The boutique arcade has nearly as many shopping stalls as Bridgehampton has shops. And there is a good-sized food arcade, tents with exhibits, pony rides for the kids, and lots more --kind of like a small scale country fair with an emphasis on horses. What is really impressive are the horse stalls, which are under huge tents on either side of the grounds. Some of the stalls have little rooms adjacent to the horse enclosures where the owners, trainers, riders can hang out in between competitions. Some of these stalls look like outdoor living rooms and have real furniture, and even rugs on the ground...and some of the tack trunks are so gorgeous, I'd like one for our living room! I didn't know where or even when Zach would be competing -- two or three competitions per show ring are listed starting at 8 AM, the length of the event determined by the size of the class. I found the High Junior Jumper Class in the Grand Prix ring, and amazingly, it was just about to start when I found a seat in the bleachers. Watching a jumping event is awesome -- the synchronicity of horse and rider as they approach and take the jumps is incredible to behold. The polish of these young riders belies their age. They sit astride their horses with such grace, and of course, in full dress, they are beyond elegant. And oh, the horses. Sleek and groomed, manes braided or beribboned, every piece of brass or silver polished to a high shine...The first few riders took down a fence or two during their round. I think the field of some 24 riders was nearly a third of the way through before a rider was "clear" -- no fences, no faults. From that point, the tension really builds, as to place, the riders must complete the circuit in the shortest amount of time without toppling a fence. The second to last contender had a fantastic circuit that catapulted her into the lead, so Zach finished fifth...but the first six places are ribboned, and get to participate in a victory canter around the ring. That's him riding up to collect his ribbon. I feel like a proud parent!! The fireflies seem to have found their mates and wandered away, and in the hot August nights we have instead the entertainment of cicadas in the trees. Soon their calls -- rather like a stick drawn quickly down a thin wooden fence -- will be joined, then supplanted by, the chirp of crickets in the darkness. Ah, the sounds of a summer night. It's high season, the weather is sultry and warm. People are out in droves, eager to squeeze the last drop of "summer" into their summer, preferably with a few good beach days and some memorable time away from home. Maybe it's the effect of the economy this year, or this need many of us feel to pull every bit of life from our few stolen moments away, but sometimes in the almost frenetic air to experience it all, have it all (and now! ), it reminds me of a line in an old Juice Newton song: "I'm dancing as fast as I can." So in what can be an exhausting time of year, it gratifies me to run into instances where people are keeping their cool, physically and mentally. The other day, I was up in Riverhead at BJ's doing some shopping, and I chatted briefly with another woman who, like me, was on her own trying to manage the self-check out station. She was in front of me, and when I finally collected my groceries and loaded them back in my cart, I saw she'd stuck a post it note to my box of cereal that read Dance like no one's watching. I've seen this quote from Crystal Boyd before, but I was struck by how much I needed to be reminded of it just then: "Work like you don't need money...Love like you've never been hurt...And dance like no one's watching." In other words, live for the joy of it and for yourself, without worrying about the opinions or censure of others. Are you dancing as fast as you can? And if so, is that truly where you want to be? Come take some time for yourself here at A Butler's Manor, and let the night music of the cicadas and the scent of the nicotiana take you away from the need to cram someone else's idea of summer into your vacation. Come dance like no one's watching. On the subject of return guests...one of the most rewarding things about owning a B&B is the friendship that develops with many of our guests who return again and again. We look forward to catching up with them each time they visit. Occasionally, we lose them as guests (but not as friends!) because of relocation or other job factors. Jack and Tom are private pilots who would occasionally stay with us when their employer overbooked his summer house here in Southampton. As often as not, they didn't need accommodations because there was room on the estate, but when they were in town, they'd often call to see if we were free, and stop over with a bottle of wine that we'd enjoy in the garden, or we'd join them for dinner at Le Chef. 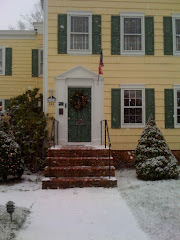 Alas -- the employer's summer house was sold last year...we sure miss them. Sometimes people fall in love with the area and buy their own house here, so we lose them as guests, but gain them as neighbors! Such is the case with John, who stopped by on his bike the other day to say hello. He's found a house in the village and may find a way to make it his primary residence. It will be fun seeing him and his family at concerts in the park and other "local" events. But mostly, it's just not summer to Chris and me without a chance to check in with some of the good people who return each year for a chance to relax in the sun! The Italians have a word for it, which is so much richer, just rolling off the tongue: Abbondanza. High summer, and that is the word that springs to mind when I look out over the garden. The roses are on their second round (despite the wet June! 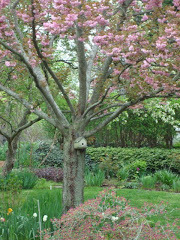 ), the dahlias are prolific, the hydrangeas in full bloom, and the grasses are lush and green. The bunnies (drat them) are having a field day. Abbondanza also describes the perfect beach day today, with temps in the high 70's and a light breeze blowing offshore, and of course, everyone wanted to be there to enjoy those rays. When we picked up guests Linda and Greg from Cooper's Beach, they said it couldn't have been a better day...well, as long as you were cautious of the undertow in the high surf. Have I mentioned that our own Cooper's Beach is ranked #4 most beautiful beach in the COUNTRY by Dr. Stephen Leatherman (a/k/a/ Dr. Beach)? We are graced with such abundance. Abbondanza was not the word that sprang to mind this week when we visited Bamboo, a favorite restaurant of mine in East Hampton. Bamboo, open year round, is a lushly Asian-style restaurant that Chris and I tend to forget attracts a hip summer crowd. It has a good sushi bar (and free sushi at the bar on Thursdays, if you can get anywhere close to the bar), a fabulous multi-course prix fixe menu offered year round, and are locally famous for their hefty watermelon martinis. We visited on a Tuesday, and it was crowded. Oh yeah -- it's July! For a change, we skipped the prix fixe menu and Chris started with crabcakes while I had a spicy crunchy yellowtail roll. One of their entrees is a mouthwatering black cod miso, which I love so much I invariably pass up the equally scrumptious Mongolian sliced beef (which Chris orders, thankfully, so I get to have a taste). But when the entree came, I was surprised: It was the smallest portion of cod I have ever seen...perhaps 4" long by 1-3/4" wide by 2" high. What are these, Summer portions? So that we all keep our bathing suit figures? Hmmmf. I admit it, most things in and around the Hamptons are not cheap, especially in the summer. Which is why it's wonderful to share some of the best things we've found you can do here for little or no money. Our favorite event here in Southampton is the Concerts in the Park series held at Agawam Park on Wednesdays between July 4th and Labor Day weekends. The band might be R&B/rockabilly (like the perennial local favorite group, the Lone Sharks), reggae, Big Band, Latin Jazz, 50's & 60's, or many other styles. It almost doesn't matter. What matters is that you grab a beach chair from the back porch, pick up a sandwich at Schmidt's or Job's Lane Deli or a pizza at La Parmigiana, uncork a bottle of wine, and enjoy the sounds of music in the open air as the sun sets over the park, and the sight of the little children (and sometimes adults!) dancing in front of the bandstand. The event is free, but the Southampton Cultural Center, who organizes it each year, sends out a bucket brigade at intermission to collect donations, and we encourage people to put what they can in that bucket...this is a wonderful resource that we stand to lose without support. Other communities out here have outdoor concerts as well -- Montauk, on the village green on Monday evenings in July, Sag Harbor at Marine Park on Bay Street on Thursdays in August. Finally, many guests here have been enjoying our favorite free entertainment each night: Firefly season in Chris's garden. Fireflies have been working their magic each night from dusk on, sparkling against the backdrop of the deep green foliage and illuminating the ghostly white flowers of the Annabelle hydrangeas, spireas, and astilbes with their brief, teasing radiance. And for those like me, who didn't grow up in an area where fireflies are summer residents, it's worth the stroll out of the car park at A Butler's Manor past Mrs. Jagger's field next door, where the sheer abundance of fireflies in their preferred habitat makes the open space a fairy-lit wonderland, almost like a miniature holiday display. Who says you can't enjoy yourself in the Hamptons without spending a lot of money? I mention this because every so often guests at A Butler's Manor surprise us with their luggage...or lack thereof. Sure, I'm impressed when a business traveler arrives with only a rolling computer case that carries his laptop and a change of shirt, tie, and undies for a single night stay. And only today, a woman arrived for a three-night stay with only a small, lightweight case (in which, she assured me, she'd still packed 3 pairs of shoes). But my hat goes off -- in fact, I sink into a deep curtsy of awe -- to the rare travelers like David and Jane, in the picture here. Look closely, and you'll see one small rollaway case that could fit in the overhead bin, one medium sized case, and two backpacks. Why am I impressed? Because A Butler's Manor was the last stop on David and Jane's TWO MONTH vacation from Sydney, Australia. AND they took home souvenirs. Now THAT'S packing!!! I mentioned last week that a recent guest categorized Southampton as the Hedge Capital of the US. Yes, locals make jokes about our estate district being called Hedgeville. In fact, a few years back, Foster's Farm, one of the last farms in the village of Southampton gave up planting crops like corn and potatoes and instead planted privet. Like a hedge fund, they're a hedge farm. It's true that the majority of the estate district is surrounded by tall, immaculately manicured rows of privet bushes, and some of those hedges are cut so exactingly that you'd swear they were really fuzzy green walls. I often tell guests that if you flew over the village in a plane, it would look like a rat maze. Now, in July, the privet is in bloom...pretty, slightly fragrant small cream-colored flower clusters called panicles. It has such a distinctive odor that I believe there is a men's line of cologne called Privet. 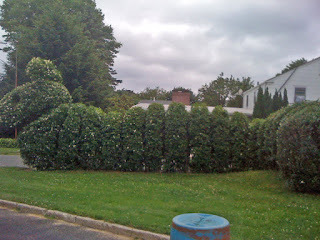 However, while out and about yesterday, I saw a different form of privet hedge trimming. Laughing, I had to pull off the road to photograph it. This would be a privet caterpillar?? Someone sure has a sense of humor...and a nice sharp chain saw! But today, July 4th, a whole different side of Southampton is in evidence, as the village holds the only Independence Day parade in the Hamptons. It steps off just feet from A Butler's Manor at the train station, so cars line our usually uneventful street, crowds pass by the B&B on the sidewalk, beach chairs and coolers in hand, andin the garden over breakfast, you can hear the drum and bagpipe corps warming up before the 10 AM step off. This is a true small town parade, and it seemed today as though the whole small town turned out to watch it. Always, and appropriately, it is led by color guards and veterans representing each war, and I have to admit, I was teary because for the first time, there were no local WWII vets riding in the parade...only a decorated car with a sign "In Memory Of" paraded to remind us of the contribution of the Greatest Generation. Still, the flags wave, and the crowds cheer, and the little kids dance at all of the various musical entries, be they bagpipe corps, a Dixieland band, or a vocal group perched on a borrowed flatbed truck. Floats are homemade and often pulled by the tractors of the local farmers (and those John Deeres are polished within an inch of their lives! ), fire trucks of all vintages from the nearby villages fire up their sirens, horns, and bells, and every member of each of the Little League teams march in uniform. We have Minutemen in authentic (worsted wool!) costume who shoot their rifles and even fire the cannon to the delight of the crowds (excepting the dogs), but we also have representives of our town's diversity, including the Shinnecock Indians in full costume, and a Latino organization called F.A.C.E.S. that fielded a dance troup that really makes you want to get up and dance! It will never rival the Macy's Day parade, but the Southampton Independence Day parade is small town Americana at its finest. 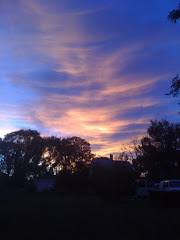 I love my early morning walk...it helps clear the sleep from my mind and gives me a chance to plan the day. 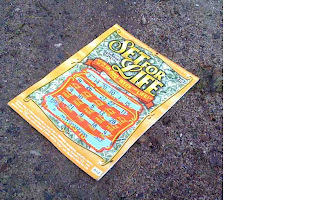 Yesterday I was walking one of my favorite routes -- from A Butler's Manor through Southampton Village south into the estate district -- when I happened upon a discarded scratch-off lottery card in the street outside of one of the large mansions on South Main Street, and had to giggle at the irony: the game was called "Set For Life," and evidently nothing matched up. I could just imagine the disappointment of the person who'd tossed it away. Guess he won't be purchasing a house in that neighborhood THIS week. Speaking of Southampton's estate district, if (like us) you're not fortunate enough to be a member of the Meadow Club over on First Neck Lane (36 grass tennis courts and a pedigree that spans centuries) and therefore not able to partake of their Lobster Feast every Tuesday during the season, there is now an alternative right in the village. Jean MacKenzie Koster, who owns both the popular fish market The Clamman and Four Seasons Caterers, has renovated the old John Duck's restaurant into a lovely catering facility with a large, airy dining room flanked by terraced private gardens. This summer, Four Seasons is opening its dining room on Tuesdays, 5 - 9:30 pm, for a classic clam bake. There is an all-you-can-eat buffet which includes some yummy pasta dishes, fresh salads, corn on the cob, mussels and clams, as well as finger-lickin'-good barbecue chicken and the sweetest lobsters Chris and I have had in a long time. A dessert bar completes the price-fix menu. For a small additional fee, a raw bar offers peel and eat shrimp, clams and oysters. And on top of it all, there is live entertainment to enhance the experience, and even a firepit on the lawn from which you can enjoy the fireflies as they twinkle amidst the garden borders. AND it is stumbling distance from A Butler's Manor...no need to drive! Works for us! Actually, early in the week is a great time for classic lobster dishes -- lots of deals on those messy, crack and peel whole steamed crustaceans, served with a plastic bib and lots of paper napkins, corn on the cob and maybe a potato, and a vat of melted butter --yum! These casual eats are best found at some of our waterfront restaurants, like Sunwater's Grill, Tiderunners, and Oaklands in Hamptons Bays, or Bostwick's in East Hampton, but you can get it just a bit more upscale (as in a cloth napkin and interior seating) at Indian Cove in Hampton Bays or even Bobby Van's (Tuesdays only) in Bridgehampton. When it comes to summer, if it means a lobster and --bonus! --a waterview, we're all for it! Yes, waiter, I'll have the lobster, please. After what seems like endless days of drizzle or rain, the other day the sun made a welcome appearance, and Chris and I took the opportunity to go out to one of our favorite places, Three Mile Harbor in East Hampton, to have dinner with a sunset. We have a couple of favorite places there: Harbor Bistro and Bostwick's, and since we hadn't yet been to either of them since the summer season opened, we decided to have an early dinner at Harbor Bistro, then enjoy the sunset over drinks at Bostwick's (which they are justifiably famous for). At Harbor Bistro, we opted for a couple of appetizers apiece: Chris had the toasted corn and jumbo lump crabcake was large, handmade, and delicious, with so much fresh crab and sweet corn that, especially with the addition of the sunshine over the marina, you could believe it was truly summer. I had a yellowtail poke with avocados (this California girl loves anything with avocados!) and a Mediterranian Shrimp-Quinoa salad, which was marvelous with a light lemon vinaigrette. Chris also had the slow-cooked duck and mushroom crepes, which I thought were yummy, but he was dismayed to find was made with tarragon, a herb he happens to dislike. Still, overall the food was marvelous and the setting restful and sunwarmed, and just what the doctor ordered. Afterwards, we journeyed up the road a half mile or so, and had a margarita in the always-lively bar at Bostwick's. Longtime bartenders Fran and Bill commandeered everyone's attention as the sun went down, and we all clapped and cheered...almost like the impromptu party for the same reason each night at Mallory Square in Key West. It seems like it's the first real sunset we've seen this season! The US Golf Open has been upIsland at Bethpage Black this week, and a couple of our guests have tickets. While it isn't close by (about an hour and fifteen minutes or so away), the guys have been enjoying the opening rounds (and tomorrow, the final) during the day while their wives have been enjoying the Hamptons. Speaking of sunsets, because the weather cleared up on Friday, Chris and I took the Mini over the Meschutt Beach in Hampton Bays, where each Friday night between 5 PM and sunset, there is an impromptu classic and muscle car display....bring your own, or just enjoy the sight of a few dozen beautifully-restored (or incredibly hot-rodded) old vehicles. There were some spectacular old Camaro z28 and SS muscle cars there last night, a pristine old Ford Country Squire Woody wagon (with all three seats and a longboard surfboard on the roof! ), and many more beauties. Live music plays at the Beach Bar until sunset, and parents enjoy it with a beer or some beach food while kids and dogs have a great time on the beach. We stayed only an hour or so, but enjoyed it (and a sunset!) immensely. And then came home to see the first fireflies of the season! Over breakfast this morning, Phyllis and Debbie, mother and daughter from Connecticut and Maryland respectively, were talking with Grant and Michele, from Kansas City...and they learned that all of them had lived in the same town in Oklahoma at the same time, only a few blocks apart!! What are the odds!? June is popping out all over, to quote the old song from Carousel. All of the birdhouses around the garden are occupied with nesting families of varying types of birds, and several more who prefer "roughing it" to moving into a premade house are guarding nests in the shrubbery or trees. (One Papa Robin whose family is secreted in a yew bush outside our office, cannot seem to learn that he is not seeing a rival in the window, but his own reflection in the glass...even though we now have an entire window of little robin's-footprints to mar the clarity of that reflection.) Walk through the garden and you'll hear the occasional chorus of little tweets and peeps as the baby birds let their parents know they are HUNGRY! If you look closely at the pictures above, you'll see one of the baby starlings peeking his beak out, waiting for his next meal...and then home delivery of the meal by one of the busy parents. Sweet. They will be fledging soon. And the roses are in bloom! Their scent is in the air over the whole garden, but especially as you walk across the grass and mount the steps towards the pool. I cut dozens of blooms for the guest rooms this weekend, set off by lemon-yellow sprigs of lady's mantle flowers, which also proliferate this time of year. The peonies are just beginning to open. The flora and fauna of the garden have enjoyed the rain showers we've had this past week...we humans were less appreciative. So far, the weather hasn't been very cooperative for the guests who are looking for a relaxing day at the beach. It's great that we have other options...Peconic Bay Winery, over on the North Fork, has a lively schedule every weekend of live music in the afternoons, with wine by the glass and even local cheese and sushi for sale while you enjoy! And closer to home, Wolffer Vineyards has added another event to its roster of things to do: Every Friday evening at their farm and wine stand on Rte 27 just east of the winery, they have a TGIF wine-and-jazz event from 5 - 7 PM, again, with free artisinal cheese and wines for sale by the glass. Chris and I haven't made it up there yet to try it out, but I expect it is especially popular with visitors arriving from Manhattan and points east after what can sometimes be a long slog through traffic. A couple of weeks ago, we took an online reservation from a gentleman named Tom, who was looking forward to showing his girlfriend the Hamptons. "Hello," he wrote, "I will arrive with a bit of an exotic car, and am a little concerned about parking. Any reassurance you can give me?" I followed up to see what, specifically, his concerns were. Was it the safety of his car? Whether we had on or off street parking? Clearance issues? The latter, he wrote back. His car was very low slung and in fact had never spent a night outside a garage before. "It wouldn't even recognize the moon," he laughed. We've had a few guests with sporty low clearance cars, but this was the first time a guest had ever thought to mention it when booking, and I was happy that he did. We have off-street parking here at A Butler's Manor, with a driveway apron of cement and Belgian blocks leading into a bluestone gravel car park. Tom's concern is understandable, because time, wear, and weather will take a toll on the relative smoothness of a gravel driveway. No worries, I told him, you're in good hands here. In addition to Chris's Mini (with a whopping 7" of clearance), we corrected just that sort of problem last summer, and have been watching it ever since. 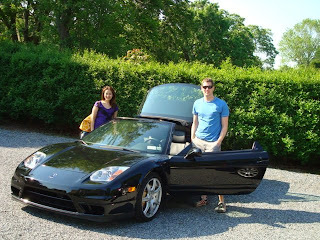 Last summer, Nick and Denise arrived in a gorgeous red Ferrari. They had friends who lived nearby, and spent the evening with them. But the following morning, Chris was concerned to see the Ferrari missing from the car park. Had they taken a cab home from their party? Or had something happened to the car? As soon as Nick came down, Chris asked him. No, everything was fine, he assured us. It's just that the car is so low slung that it sort of "bottomed out" going over the transition between apron and car park, so he'd left the Ferrari at their friends' house, and instead drove his buddy's car home. Chris went out and looked at the driveway. Sure enough, rain and traffic had worn a sort of dip under the apron. That didn't make it welcoming for the Ferrari...and as we well know, car aficionados consider their babies part of the family! Well, that would never do. Chris told him that when they came back in the afternoon to bring the Ferrari home, because that issue with the car park would be fixed. And then he got on the phone and called our neighbor, Perry Delalio, who has a gravel business. Perry sent a couple of his guys and a few yards of replacement bluestone gravel right over, and they leveled that driveway in two hours flat. (Pun intended!) And when Nick and Denise came home that afternoon, that car purred straight into the car park without a problem. When Tom and Tomoko arrived yesterday, his sleek little baby glided over the apron just fine, and everybody was happy. And, since it was almost full last night, it's now met the moon! Success! So bring it on...Aston Martins, Jaguar E-types, Ferraris, and more...they're welcome here! It's been exciting around here, publicity-wise; we've been fortunate lately to have caught the attention of some of the local media. Just before Memorial Day, writer Cathy Meinhold did a profile on A Butler's Manor for On The Jitney magazine (a classy little mag that is distributed on the Hampton Jitney coach service between Manhattan and the Hamptons). A week later, we were listed (with a photo!) 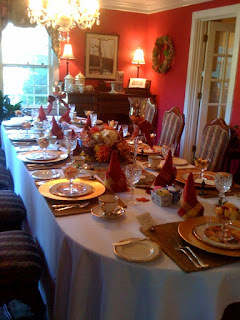 as a Southampton Bed and Breakfast "worth the splurge!" in Long Island's Newsday. And today, writer T.J. Clemente from Dan's Papers came by to interview Chris about life as a butler...and how that has led to opening A Butler's Manor. Chris is a difficult interview, determined that it is not cricket to identify former employers (as any good butler would agree), but the stories are always fun, even without the "name" behind the name. And an hour after the interview, the Master Butler was back to his alter ego as the Master Gardener (above, tying up his lilies). Speaking of gardening, I've posted a June picture of one of our more unusual perenials: This is a form of allium (onion family) called Sherbertii. I call it the Firecracker Allium, because in full bloom (in the photo above it isn't quite there), each of its stick-like stalks sport a tiny star-like flower...sort of like one of those aerial fireworks where each of the exploding rays of color then launches a secondary sparkler. The blue flowers that surround the Sherbertii are Johnson Blue geraniums, happily in bloom (and probably loving the rains we've had this past week). We're enjoying catching up with returning guests this weekend -- three of five of the rooms are repeat guests, each having been here at least three times before. And yay! the weather warmed up enough to warrant trips to the beach, and laps in the pool! We love it when guests enjoy themselves while visiting A Butler's Manor. We especially love it when guests enjoy themselves over breakfast. And when guests make friends with other guests, laughter rings from the table, and everyone lingers long past the plates being cleared away, that is the best thing of all. Today we had eight for breakfast (menu: Banana Decadence French Toast) -- a young pair from Italy, eager to explore the beach on such a sunny day, two from Pennsylvania, celebrating an anniversary, a couple from the UK who were checking out after a week long stay, and a Long Island couple on a two-night "staycation" (a recently-coined term for a local getaway, as in: Need a break, no time to travel very far...how about a Hamptons B&B?). In spite of the promising day, six of the eight lingered over breakfast, sharing stories, laughter, and information. When they finally rose from the table to begin their respective days, the local couple had helped the British couple plan their last day on the Island...with suggestions for "upIsland" attractions en route to Newark Airport, from which their flight was to go out later tonight, and all of the guests had exchanged email addresses...and hugs! I love it!! Half of our lovely guests this week have been members of the US Senior Golf Tournament, an event that is held here in the Hamptons each year at this time. These guys are awesome golfers playing awesome courses: Shinnecock, National, Maidstone and the newer Sebonack Golf Course. It is an especially well-organized event; the organizers have private dinner events planned for each night of the tournament, they know where each of the players are staying, and they even go to some trouble to coordinate the tee times of players staying in the same place, so to encourage carpooling. This is especially helpful when the members' wives also golf, as they have a separate tournament for the ladies...and when he's to play Shinnecock (in Southampton) and she's to play Maidstone (in East Hampton), somebody is going to be without a car! Golf events, like business travel, mean early bird breakfasts, so we've been doing a double breakfast seating all week. Our leisure guests this week have included a couple from Switzerland and a couple from England. 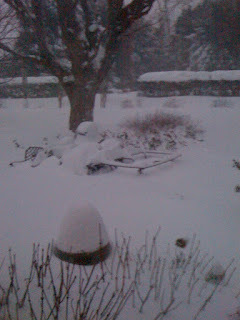 Alas, the weather this week hasn't been nice enough to serve breakfast in the garden. There sure is! In fact, we have a doctor in each one of our five rooms this weekend. What are the odds? No, there isn't a medical convention somewhere. Just Memorial Day weekend. It's a busy weekend, too -- the official kick off to Summer 2009. Ran into town to pick up a few things, and it took me longer to find a parking space than it did to run my errand. It certainly looked like a summer weekend in the Hamptons! Everyone has broken out their white clothes (does anyone remember that old adage that you weren't supposed to wear white until Memorial Day? ), sleeveless tops, and flip flops. Every outdoor table was full outside the restaurants, the Golden Pear, and the Village Cheese Shop, and the streets were thronged with window shoppers. There were three people in line before me at the cash register in Bookhampton. Nice to see! Speaking of doctors, which makes me think "health:" This past week we had a guest who was part of a golf club outing, playing National and Maidstone courses. Golfers, like business guests, are generally on a schedule with early tee times, so we accommodate them separately from our leisure guests, who breakfast later. Dan was really watching his diet -- no carbs, tons of protein, and told me his usual breakfast was egg whites and turkey bacon, plain yogurt and blueberries. Of course, yogurt and fruit are no problem -- we have nonfat Fage yogurt that has the best texture of any yogurt I've ever had! But I'd never tried turkey bacon, so I bought some for him. I tried some too...not bad at all, especially if you like bacon crisp, as I do. But egg white omelettes are challenging because by themselves, egg whites have absolutely no flavor, and I want each breakfast served at A Butler's Manor to make a great impression. So I chopped a tomato and some fresh herbs from the garden and added it to the omelette. Dan was a happy camper. The other golfer, Jeff, was staying an extra day. He was so intrigued by his friend's meal that he wondered if he could have something similar for breakfast on his last morning. I was making our Manor House Omelette (a baked omelette with Canadian bacon, fresh spinach, and Gruyere cheese) for our leisure guests, so I made Jeff (and me!) a version with egg whites, scallions, crumbled turkey bacon, and about a tablespoon of grated Jarlsberg (a light Swiss cheese). Hey, it was some kind of yummy! Proves that eating healthy can be tasty too. Truly, necessity is the mother of invention! Chris and I come by our inability to see anything wasted genetically. Chris was born in an England still under rationing (did you know? -- until 1954! His parents were still dealing with it in the late 1950's!) and my parents came of age during the Great Depression which, I have learned, marks those who have been through it (and the generation beyond!) for life. What this has translated into for us is a propensity for rescuing things, repurposing things, and recycling things. Our latest endeavor involves our newest neighbors -- a lovely couple who have become friends. They've done an incredible job restoring the period house up the street from A Butler's Manor. Now they're working on the back yard, in which they're planning to put a pool. The existing backyard was designed by a landscape gardener, and Chris had seen it prior to the house being sold. When our new neighbors told us they planned to clear most of the yard and offered us anything we could use, Chris jumped at the chance. So we are now proud new owners of dozens of shrubs, perennials, and even an ornamental tree or two (--!!! ), but the thing Chris is most thrilled with is that we rescued a garden shed from demolition. It took some doing to figure out how to move it, but in the end, he took down the fencing at the back of the property, hired a friend with a big forklift, and the pair of them muscled that little potting shed down a narrow driveway, down the street, up behind our house, and plop! into the very back of our garden, behind the pool (about 20 feet straight back behind the Japanese maple). We spent most of last Saturday evening reinstalling the stockade fence at the back of the property. The little shed will be perfect for summer storage of winter essentials, such as a snow blower, a generator, a chipper shredder, etc., and come winter, will house what is now essential to Chris's summer gardening efforts so that the latter items can be housed closer to. Our neighbors now have a clean slate on which to dig their new pool, and we have even more of a lush garden...and a place to pot those lush plants up...and we are grateful!! I tell, you, I love this business. Guests are the gift that keeps on giving. Any time we have guests who've never been to the Hamptons, we give them a copy of our itinerary (unless, very cool, they've already downloaded it off our website). The itinerary isn't formal; rather, it's what we take our visiting families to see in each of the villages. Last fall, a delightful family of three from Germany stayed with us, as part of a New York trip to celebrate the daughter Nina's eighteenth birthday, and of course, we went over the itinerary with them. They had a great time with it, and afterwards, Nina offered to translate our itinerary into German. As we've tried (with sometimes comical results) to do this before using Babelfish.com, we were very happy to take her up on it. This week, coincidentally, we had two sets of German guests a couple of days apart. While they all spoke very good English, when I prepared a "what to do" package for each of them, I remembered to give them a copy of both our English and Nina's German itinerary. They were so pleased to have something like this in their own language! It just made my day! In the three months between the time that we bought the property that would become A Butler's Manor and our official opening in late April, 2002, I was eager to develop a variety of breakfast entrees to introduce to our guests. To that end, I would scour through cookbooks and online sources, try recipes, tweak them if necessary, until eventually I developed my own repertoire of breakfast recipes. Problem was, Chris comes from the school that states Thou Shalt Not Serve Thy Guest Something You Haven't Perfected First...he was very nervous about my trying things for the first time on guests. Ergo, I practiced on us. For three months, every dinner I made was actually a breakfast until he started saying, "Oh no, not French Toast for dinner AGAIN!" Beat the eggs with the salt and pepper until frothy. Heat the oil in a small nonstick skillet over medium heat. Add peppers and cook just until softened, perhaps two minutes. Remove from skillet and set aside. Add eggs, swirling to coat pan, and cook, lifting sides to allow uncooked egg to run underneath until underside is set, about 1 minute. Sprinkle the asparagus peppers, peas, and half of the cheese over one half of the omelette; fold the unfilled half over to enclose filling. Sprinkle with remainder of cheese. Cook until cheese is melted, about 2 minutes. Slide onto a plate, sprinkle with chives, and enjoy! * BONUS: I've adapted this from the new Weight Watcher's Momentum Cookbook -- replace eggs with 1/2 cup Egg Beaters, and use a low-fat version of the cheese, and this very filling meal is only 3 points! The Long Island Mini Enthusiasts (LIME) annual Road Rally descended upon A Butler's Manor like a flock of starlings yesterday...swooped in for a pit stop (cookies and lemonade in the garden), then journeyed on to lunch at the Southampton Publick House. How fun it was to see a long line of little cars all the way up the street! About 15 of the Minis pulled into our car park...and, had any of our guests arrived during their brief visit, there STILL would have been room to park! ha! Organizer and chief photog Tom Abbe will doubtlessly be forwarding his "real" photos soon, but here are a few I took as the club arrived and enjoyed a break from their drive.